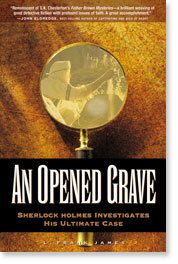 In the midst of retirement, Sherlock Holmes is lured into what he believes to be a simple missing-person case. While investigating his new case, an apparent miracle saves his life and causes him to begin to question his own world-view. His client, the lovely and devout Miss Elizabeth Hackberry, offers him an explanation for the life-saving miracle--an explanation that challenges all that he knows and believes. In his attempt to prove or disprove Miss Hackberry's belief that God was the One who saved his life, Holmes reaches the conclusion that he must personally investigate the most controversial, ancient mystery of all time--the death and resurrection of Jesus Christ. As a result, Holmes and Dr. Watson set out on a dangerous journey to Jerusalem. Along the way they face imprisonment, scoundrels, slavery, starvation, hostile sheiks, and a treacherous villain who turns their journey into a cat-and-mouse game. Frank James is a pastor at Valley Springs Presbyterian Church in Roseville, CA, and holds an MFA degree in Theatre and Drama from the University of California, Los Angeles (UCLA). He is the recipient of numerous acting awards, including; the Elly Acting, Birdsal Acting, Robert Reed Acting, and Bank of America Best Actor. Frank is an accomplished playwright and has performed, directed, and toured with groups such as; Theatre Du Terte Paris, Last Minute Production (co-founder), Actors Alley Theatre, Long Beach Civic Light Opera, and Richmond Sheppard Theatre, Hollywood, among others.